The clock is ticking towards publication of Arkship Obsidian (it’s available for pre-order right now) and I’ve just finished a short story that acts as a prologue to the main book. It’s called Arkship Countdown and you can get a copy of it for free just by joining my mailing list. I send out a newsletter every week or two with news, free content and much more, so why not sign up? Arkship Countdown is set directly before Arkship Obsidian and includes some of the same characters. It’s the perfect way to get a feel for the Arkship universe. It’s set in a distant future where Earth has been destroyed, the entire solar system turned to dust by a cataclysmic event known as the Fracture. Now, the last survivors of humanity live on vast arkships drifting through the Cluster, doing what they can to survive in a hostile ever-changing environment. 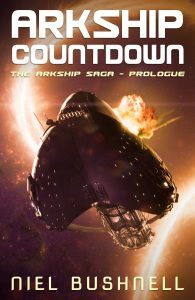 Want to read Arkship Countdown? Just CLICK HERE and sign up for my newsletter to receive your free copy.